Google Play Store is a the official web store for Android apps worldwide. It is used by billions of users around the world for various tasks and functions. Google Play Store helps keep your device updated with latest and useful Android apps. Despite the fact that it is a must have tool, it sometimes comes with certain issues which affect users negatively. One of such issues is “Google Play Store Server Error” which prevents users from using the apps store for critical installs or updates. To deal with this error you can follow some simple steps to fix the problem. Let’s discuss few methods to fix Google Play Store Server Error. · Go to device Settings. · Click on Application Manager or Apps. · Swipe right to open ALL tab. · Now scroll down to find Google Play Store app and click on it to open. · Here find the “Clear cache” and “Clear data” buttons and click on them. · Now go back and search for Google Service Framework app from the list. Click on it to open and press “Clear Cache” and “Clear data” buttons. · Restart your device and try to open Google Play Store to see if the problem has been fixed. In this method, you need to manage your device’s date and time settings as invalid date and time settings may occur Server Error. To do this follow below-mentioned steps. · Go to Device Settings > Date and Time. · Now check whether the Date and Time are correct or not. If it is not, then turn OFF the Automatic Date and Time function and set date and time correctly. · Check whether the Time Zone is selected correct or not. If the Time Zone is not correct then switch to Manual mode and set the Time Zone correct according to your region. · Click on Accounts and then Google option. · Select your Google account and remove it. · Now, restart your device and configure a new Gmail account. · Try to open google Play Store to check if the problem is fixed or not. Follow this step as a last resort when everything else doesn’t work. In this method, you need to Factory reset your Android device. Remember factory reset will wipe out all your data from your device so backup all important data before proceeding to this method. To follow this method, try these steps. · Click on Backup and Reset option. · Now click on the option called Factory Reset. · When prompted, touch Erase Everything option and agree to its disclaimer message. · Wait for some time to process get finished. It will restart your device further. · Now go to Google Play Store to check if the problem has been fixed. 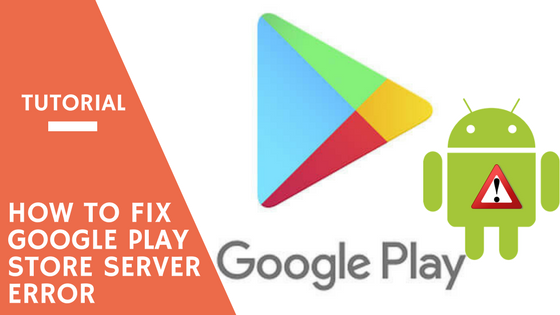 You can try these simple methods to fix your Google Play Store Server Error. These methods can surely help you fix your problems. For other Android related problems like cluttered and unorganized data or slow performance etc. you can try best Androidcleaner apps to clean your device effortlessly. These apps are smart tools to manage your data and improve device speed and performance significantly. This article was submitted by Yogesh Sharma. Yogesh is working as an SEO personnel and technical content writer for Systweak. He likes to talk about various threats to cybersecurity and cybercrime awareness in his blogs. To submit your own guest post, click here.